The vote to roll back net neutrality rules on Thursday was slammed by tech giants like Amazon, Facebook and Netflix. But the move was applauded by internet service providers. The Republican-led Federal Communications Commission voted 3-2 to repeal regulations aimed at protecting net neutrality -- rules that ensure internet providers can't deliberately speed up or slow down traffic from specific websites or apps. Nor can they put their own content at an advantage over rivals. The rules were first put in place under President Obama in 2015. Nothing is set in stone yet. The repeal isn't set to take effect until next year. The issue may ultimately end up being decided in court, and Congress may step in with a legislative solution. A recent poll by the University of Maryland's School of Public Policy found net neutrality rules have broad support among consumers -- 83% to be exact. Here's what some companies and business leaders had to say after Thursday's vote. "I am extremely disappointed in the FCC decision to remove the #NetNeutrality protections," Vogels wrote on Twitter. "We'll continue to work with our peers, partners and customers to find ways to ensure an open and fair internet that can continue to drive massive innovation." "Today's decision from the Federal Communications Commission to end net neutrality is disappointing and harmful. An open internet is critical for new ideas and economic opportunity -- and internet providers shouldn't be able to decide what people can see online or charge more for certain websites," Sandberg wrote on Facebook. "We're ready to work with members of Congress and others to help make the internet free and open for everyone." "The open internet benefits consumers, business & the entire economy," Smith wrote. "That's jeopardized by the FCC's elimination of #netneutrality protections today." The open internet benefits consumers, business & the entire economy. That's jeopardized by the FCC's elimination of #netneutrality protections today. "We're disappointed in the decision to gut #NetNeutrality protections that ushered in an unprecedented era of innovation, creativity & civic engagement," read a tweet posted on Netflix's verified account. "This is the beginning of a longer legal battle. Netflix stands w/ innovators, large & small, to oppose this misguided FCC order." We're disappointed in the decision to gut #NetNeutrality protections that ushered in an unprecedented era of innovation, creativity & civic engagement. This is the beginning of a longer legal battle. Netflix stands w/ innovators, large & small, to oppose this misguided FCC order. "We cannot let this happen to our internet in the US," Ohanian tweeted. "We must keep fighting for #NetNeutrality." We cannot let this happen to our internet in the US. 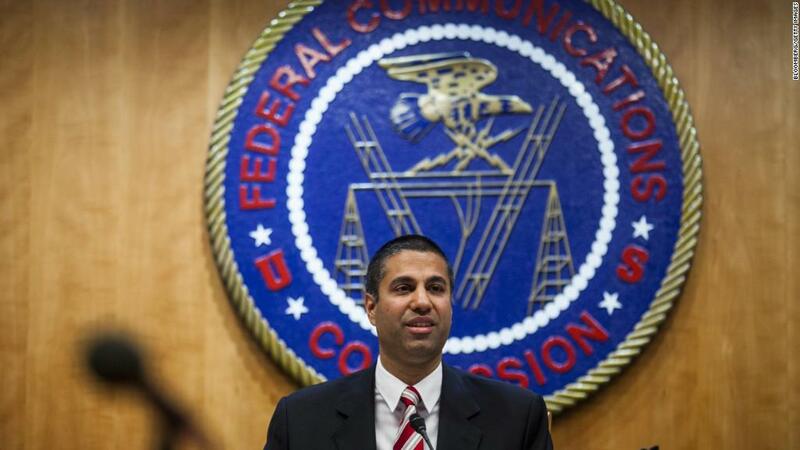 "It's disheartening that the #FCC chose to ignore the public and approve a policy that benefits the few and powerful at the expense of creators, and the stories they work to tell," the company posted on Twitter. "We look forward to challenging this misguided decision in court. #NetNeutrality"
Not everyone is behind the net neutrality rules. Internet service providers like AT&T, Verizon and Comcast have a lot to gain from loosened regulations. (AT&T is seeking to acquire Time Warner, the parent company of CNN). "We do not block websites, nor censor online content, nor throttle or degrade traffic based on the content, nor unfairly discriminate in our treatment of internet traffic," the company said in a statement. "These principles, which were laid out in the FCC's 2010 Open Internet Order and fully supported by AT&T, are clearly articulated on our website and are fully enforceable against us. In short, the internet will continue to work tomorrow just as it always has." "Verizon fully supports the open Internet, and we will continue to do so," Johnson said in an emailed statement. "Our customers demand it and our business depends on it." "Today, the future of our open, thriving internet has been secured," the group, which represents companies including AT&T and Verizon, wrote. "America's broadband providers -- who have long supported net neutrality protections and have committed to continuing to do so -- will have renewed confidence to make the investments required to strengthen the nation's networks and close the digital divide, especially in rural communities." --CNN Tech's Seth Fiegerman contributed to this report.